It's another warm, sunny day, and we're all glad to be far from rainy, cold Germany. A good day. And it's good to hear Harun talking about my favorite topic, spirituality. It seems this is also important to him. He tells us a little bit about Sufism, the mystical part of Islam, the path that seems to fit best with Christianity and eastern spirituality as well. It teaches its followers to go beyond dogma, into the heart of things, to develop a heartfelt relationship with their Creator. Certainly that can be reconciled with any religion. Mazhar Mallouhi, a man who calls himself a Muslim follower of Jesus, belongs to a group of Sufis. The singer Yusuf Islam, also known as Cat Stevens, is a Sufi. The poet Rumi (his name in Turkey is Mevlana) was a Sufi. In fact, his son, also one of his followers, founded the famous Mevlevi Sufi order. This is the group that we in the west call the whirling dervishes, those people dressed in white robes and funny high cones for hats, who use a whirling sort of dance as a means of abandoning their sense of self in order to unite with God. I once went to see a group of these people dance at Columbia University, so I have some idea of what Harun's talking about. Harun says, "Sufism has a lot to do with the Turkish culture. In Sufism, you go the indirect way." He says the Turks are indirect people who would rather sacrifice clarity than say something clearly that would offend another person. "In Turkey, you'd rather hurt yourself than offend someone else." He says that since they so often hide it, you might think that Turks were thick-skinned. Just the opposite is true, he says, so try and be tactful when talking to Turkish people. I wish I knew some Turkish people to be tactful to. In Germany I feel like the narrator in Coleridge's "Rime of the Ancient Mariner", Water, water everywhere, nor any drop to drink. I see Turkish people every day, but know none of them. In Egypt, I learned that Sufis honor certain people as saints. This is actually one of the traits of the Shiites. The Sunnis, the branch most Egyptians belong to, believe that no one should be elevated above anyone else. Even Mohammed is only another follower of God, albeit a prophet. But a prophet is only someone who helps us come closer to God - not a holy person. I get the feeling that spiritual practices are very important to Harun. He doesn't talk individually with anyone in the group. I noticed last evening that he didn't touch the wine. His eyes have the clarity of one who values purity. He's well organized and seems very disciplined. I wonder how often he fasts. For sure, I think, all of Ramadan, and that very faithfully. But he does not ignore external things. He comes to us every day dressed in quality casual. His little beard is perfectly trimmed. He seems to value high quality brand names - his jacket and backpack bear the logo from "North Face". We're on our way to Beylerbeyi Palace. Peter tells me how he remembers this complicated name - "Boiler Bay", a place in Oregon we go to with my sister when we visit. In order to get there, our bus takes us along the European side of the Bosphorus for a while, until we reach a bridge that reminds me of the Golden Gate Bridge. 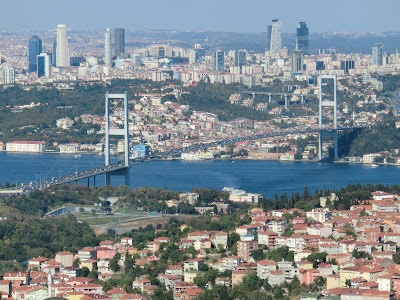 This is the Bosphorus Bridge. Before we get to the bridge, we see gorgeous apartment buildings along the hillside. What views these people must have! One of them has a rooftop infinity swimming pool. Harun tells us the obvious, that these apartments are for the wealthy. He says these apartments go for at least $1500 per square meter. Are these Sufis living in these apartments? 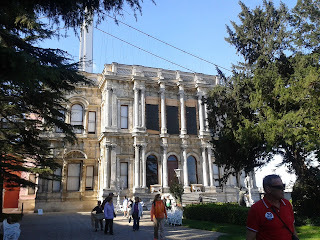 Beylerbeyi Palace lies in all its pomp just underneath the bridge on the Asian side. We are not allowed to take photos, so you'll have to refer to the link I've provided on Beylerbeyi Palace to see what the inside looks like. The palace is more opulent than the Versailles, and at least as luxurious as the apartments of Napoleon III that you can see in the Louvre. There is a connection between these apartments and the sultan who lived in this palace, we learn. Harun tells us that this nineteenth palace was built as the summer residence for Sultan Abdülaziz, and in contrast to the Topkapi Palace, is very European in style. Turkey and especially their sultan, who himself was one quarter French, looked to the French as models of modern luxury. He was very musical and even composed some classical music pieces. Abdülaziz reigned from 1861-1876. He became unpopular because of his excessive lifestyle, and at the end of his life was sent to another palace in exile, where he was forced to live in the tower. I later learn in Wikipedia, not from Harun, that officially, Abdülaziz died by simultaneously slitting both wrists with scissors - something very unlikely to happen to one living as a prisoner in a tower. Another sultan apparently murdered. Abdülaziz was in power at the time the Suez canal was opened, and it was this sultan who introduced the first railroad to Turkey - the Orient Express. We learn that one of his visitors was Empress Eugénie of France, the wife of Napoleon III, who came to visit the sultan without her husband. Eugénie seems to have been a favorite guest of the sultan. He took her to meet his mother, arm in arm. Upon seeing the empress, the valide sultan - the sultan's mother slapped her across the face. No foreign dignitary should be seen in her private quarters. Perhaps she sensed something more. Harun tells us that according to rumor, the sultan spent at least one entire night in Eugénie's room during her private stay of two weeks. In her old age, she visited the sultan's son, and he told her something about his father that made her age years in just one hour. Her room is elegant, as is the entire palace. Each room of the palace has Bohemian crystal chandeliers. All the ceilings are hand-painted with decorative motives, and each room is color-coordinated. The banisters on the main stairways are made of inlaid wood. We don't get to see the harem. Sultan Abdülaziz had six official wives and ten children. I see no traces of ascetic Sufism or of any religion at all in this sultan. Is this what the Europe of the nineteenth centurey had to offer? Canals, railroads and self-indulgence? From here we drive to the top of a hill above the palace, to the highest place overlooking the city. The view is inspiring. 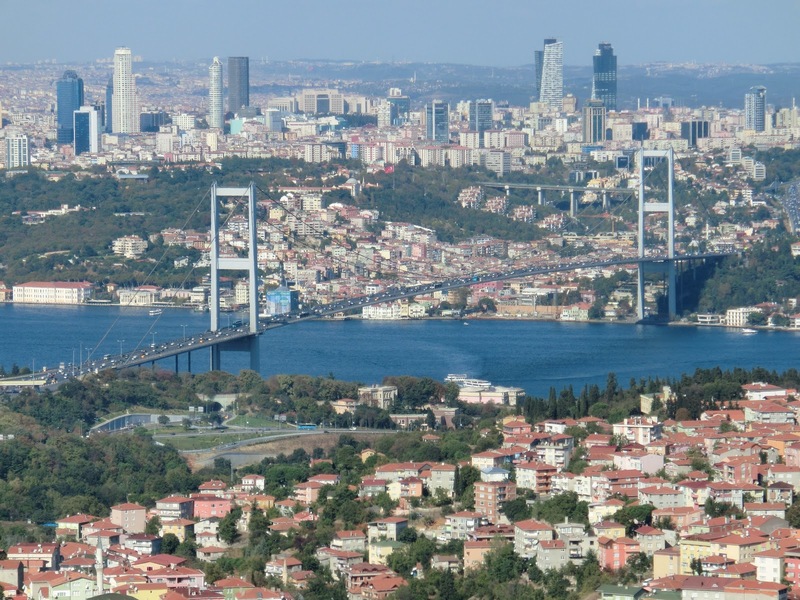 We see all of Istanbul - in fact, the city stretches far beyond what the eye can see. And water is everywhere. 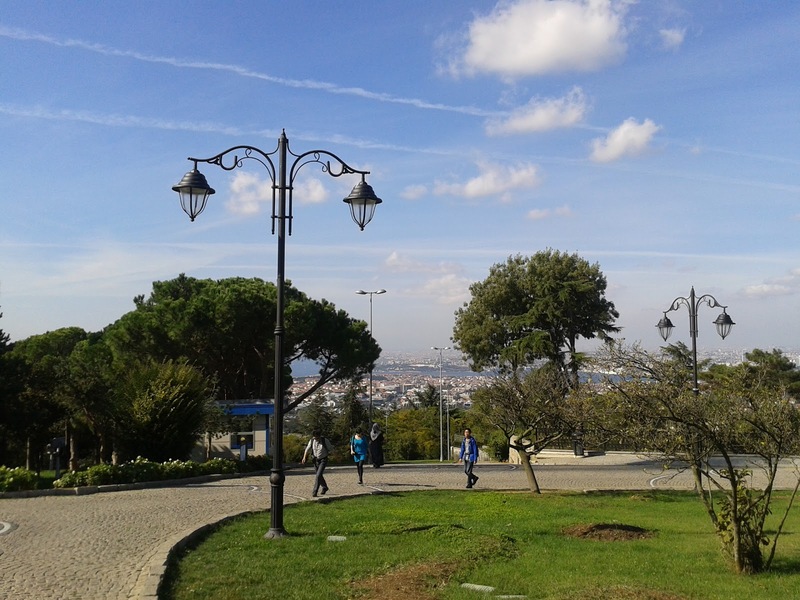 We can see the Bosphorus, the Golden Horn and even the Marmara Sea. There are hills and forests just outside the city. And it all looks prosperous. Harun tells us that on the Asian side many Greeks have moved back and built lovely villas. Saudis and other Arabs are also living on this side. We have tea and date-filled pastries in a tea house in the garden. Here, Istanbul feels tranquil - nothing like the Istanbul we join later in the evening at Taksim Square. Harun sits off to the side, avoiding any private conversations. I am exhausted and feeling a little ill, after all. I'm not sure if it is from the food from the previous evening, or what it is - I'm just a bit out of sorts. 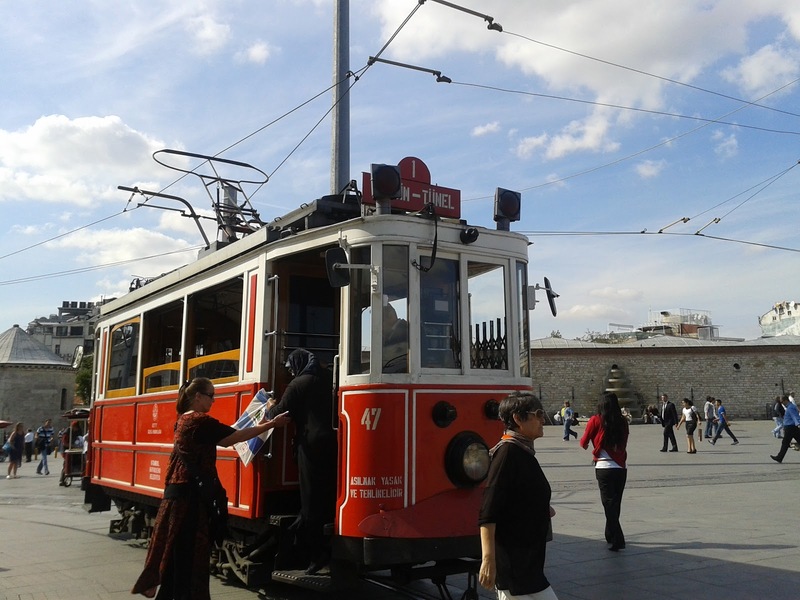 I leave the group and find my way, alone, to our hotel by way of the Tünel train and the nostalgic tram. In this city it is no problem at all for a woman to travel alone. In the afternoon I listen to a talk and discussion by Frau Ingrid Iren, one of the translators of Orhan Pamuk into German. She impresses me with her humility, simplicity and loyalty to Turkey. Her Turkish husband died only a few years after their marriage, but his family took her in. Out of love for him and gratitude to his family, she has chosen to spend her entire life in Turkey. She is encyclopedic in her knowledge of Turkish literature. I want to read more. In the evening we join two people from our group for a traditional Turkish dinner in the restaurant Harun has recommended to us - Türes, just off the Istiklal Cadessi. We join the racing pulse of Istanbul night life. Don't these people ever stay home? The food at our restaurant is good, the prices are low, and the service is great. But it's just not the same caliber as the Develi restaurant. I like it here in Istanbul very much, but it doesn't tug at my heart like Cairo does. There are some similarities, such as a Muslim culture, but perhaps it is this very culture that separates the two. Istanbul, despite all Harun says about Sufi spiritualism, feels much more western and materialistic than Cairo. It is certainly more comfortable. It feels more like life in Europe. If I were to choose a place I felt safe to live in, it would be Istanbul - over any European city. It has less crime than any European city I know, and is beautiful, modern except for all the old mosques and palaces, and comfortable. How many of these comfortable people are spiritually hungry? I have no idea - I don't know anyone at all, except for a very little bit of Harun. Perhaps there are many more like him. "Humble living does not diminish.